Asparagus. The tall green trees of the vegetable forest. They are cousins to broccoli; the shorter, fuller shrub like relative. But trees, all the same. I love these tall beauties all on their own, just as much as when mixed in with other vegetables. 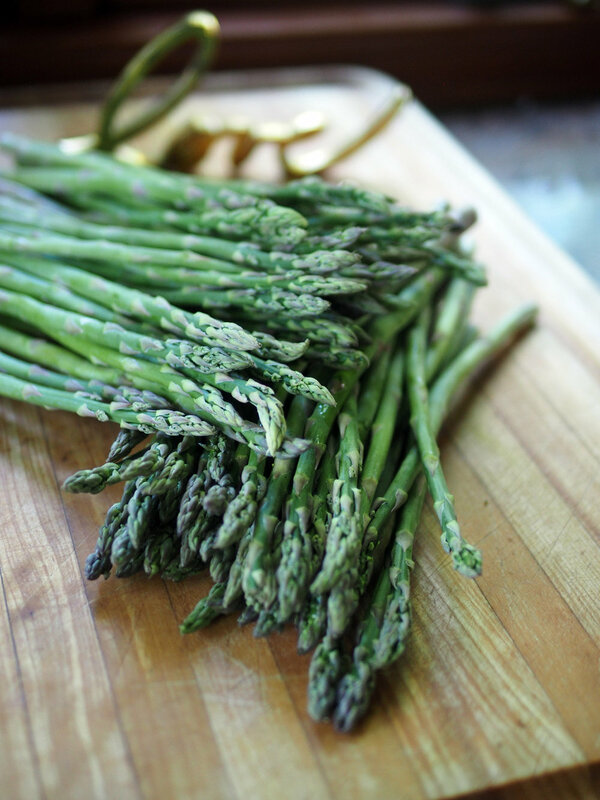 I love asparagus grilled, or sautéd, roasted or steamed. It's safe to declare that I simply love them. I guess all that love started a want. How can I include these more often but with flair. That's when I began flirting with ways to enhance these long, earthy stalks. A simple addition of one or two extra items is all that was needed. Once I did, they went from average vegetable side dish, to a 'stand out, move over' dish. It doesn't take much to make them shine brighter. Here are three ways, but I don't need to tell you that there are countless others. Long, tall, green. Like cypress trees swaying in the wind. Asparagus, chorizo, caramelized onions, goat cheese, lemon, shallot, quail eggs. The first time asparagus arrived at my enhancement clinic, I made hard boiled eggs, quartered them, steamed the asparagus, scattered some thinly sliced shallot then drizzled the entire dish with balsamic vinaigrette and served them as an appetizer. My latest upgrade; swap the big ole chicken egg for their diminutive cohorts, the quail egg, I must admit I loved it even more. The quail eggs are petite and deliver a more delicate touch. When cooking the quail eggs, drop them in boiling water for only 2 minutes, then into a bowl of cold water, and peel. This amount of cook time and cold water shocking provides soft yolk perfection. The next time asparagus showed up for some freshening up, I grilled them, let them cool slightly then crumbled goat cheese along their bristled tops, let it rain lemon zest and drizzled a red wine, lemon shallot vinaigrette. It's truly as simple as adding goat cheese, lemon zest and drizzling with a red wine shallot vinaigrette. This ain't brain surgery, I know but it does taste good to the brain, the taste buds and the belly. The third time the asparagus knocked at the refresh clinic, they were seeking a bit more intensity. So a good helping of sautéd chorizo and caramelized onions with just a drizzle of oil, coarse salt and pepper fit their request. Sauté chorizo and chop into small pieces, add caramelized onions and drizzle of oil. Asparagus in quiche. Or salads.